Your freezer is no one-trick pony. While it does excel at keeping your food fresh for as long as possible, it has a few secret talents it doesn’t want you to know about. Like making soda slushies and pyro-friendly smoke mix, as well as reviving dead hard drives. Even better—it can help you do laundry. So instead of stuffing load after load of laundry into your washer and dryer, let your freezer do some of the heavy lifting. It’ll help clean your jeans, break in new shoes, de-stink smelly shirts, and more. Read on to see all the magical laundry-style skills your freezer has. Can’t stand your perfectly soft and fuzzy sweaters leaving clumps of fur behind? 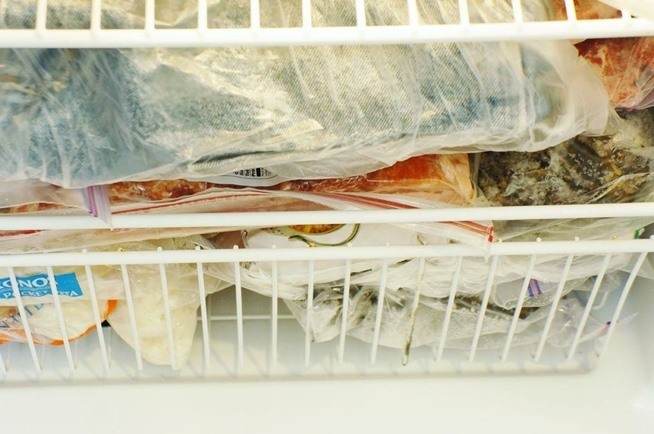 Cosmopolitan writer Brooke Shunatona suggests using the freezer to stop your shedding woes. 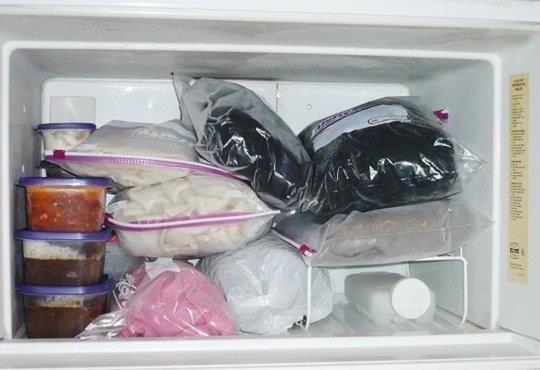 Encase your sweaters in a ziplock bag, and place them alongside your frozen vegetables. 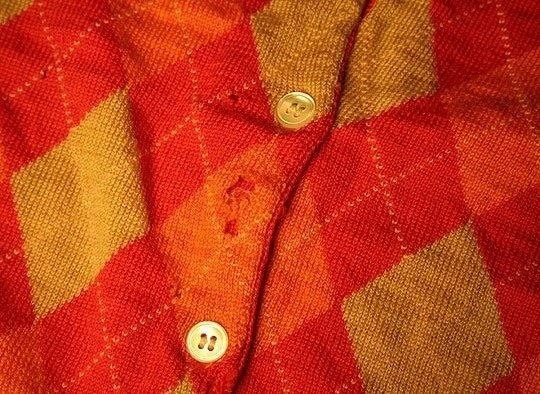 In just a few hours, the cold temperature will draw the sweater’s fibers together, locking them in place and preventing any future shedding. Cosmopolitan recommends this method for particularly furry offenders, like cashmere and wool. There’s nothing more disappointing than watching your darkest, most comfortable jeans fade from deep blue to just sad in the span of a few washes. Don’t send your favorites through the wash; instead, stick your jeans in the freezer. Why does the freezer work on jeans? According to Jill Guenza of Levi Strauss, jeans develop bacteria over time and wear that causes them to smell. When they start to get stinky, we tend to toss them into the wash—but that’s what wears both their fabric and color down. Guenza instead recommends sticking your jeans in the freezer, where the bacteria can be killed by the cold temperatures and rid the fabric of its odors. If you’re like most who suffer from endless blister pain every time they slide on a new pair of shoes, you’ll want to toss your newest pair into the freezer immediately. With the use of water and cold temperatures, you can break in your tight shoes. 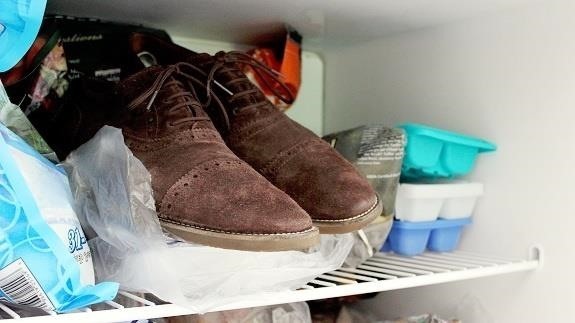 Fill some freezer-friendly plastic bags with water, and stuff them into the tightest parts of the shoes. Place them in the freezer, and, as the liquid freezes and expands, it will stretch the material without pain. It isn’t every day that you sit or fall into a sticky piece of gross gum, but it can happen—and you don’t have throw out your clothes when it does. Instead, as Yumi Sakugawa advises, you just need to add some ice or use your freezer. Gum adheres strongly to the fabric of any clothing, but when you stick the item in question in the freezer, it becomes loosened. 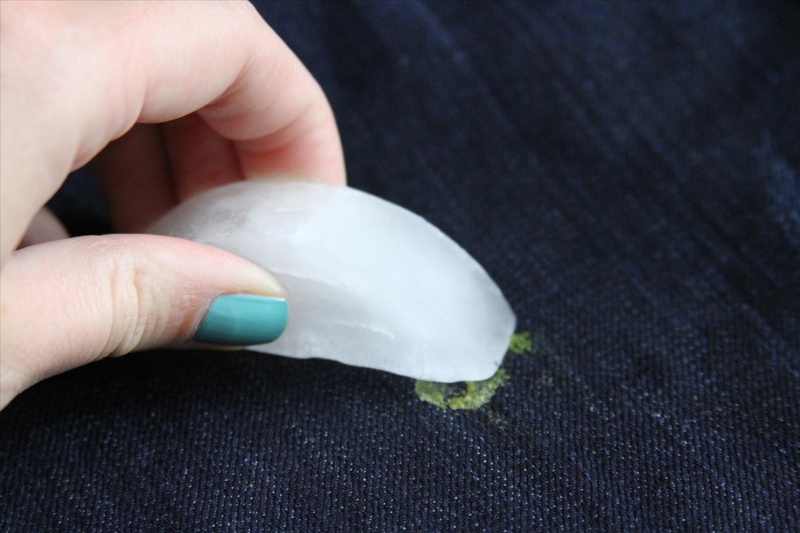 With just a few hours in the freezer, you can harden the gum and pop it right off your favorite pants. Similar to gum removal on clothing, you can get the stickiest of substances off your shoes by tossing them in the freezer, according to Reddit user tomer_360. Whether you’re stuck with disgusting animal poop or gooey gum on the sole of your shoe, stuff the offending shoe into the freezer. The low temperatures will harden whatever you can’t remove, allowing you to peel it off easily without facing the bacteria that comes along with it. Tights are a struggle, whether they’re brand new or an old favorite. They rip incredibly easy, making it difficult to even get them on—but according to Refinery29 writer Leann Duggan, a dose of intense cold can strengthen that flimsy material. According to the site, the first thing you should do with new tights is run them under water, squeeze out the excess liquid, and stick them in the freezer. The next day, you simply need to warm them up to room temperature before pulling them on. Don’t worry about repeating the process—only one round in the freezer is enough to strengthen the fibers. Can’t get rid of your daily shoe stench each time you slide off your shoes at home? Dummy Mag suggests sticking your shoes in the freezer to stop the smell. Just as the freezer’s cold temperature kills the bacteria that grows on jeans, it can eliminate the months of rankness growing inside your favorite shoes. Stick them inside, and you’ll be able to take off your shoes in public once again without making your friends gag. Bug infestation isn’t a fun topic, and it’s a difficult thing to tackle no matter the pest. If you’re struggling with bugs who’ve made a new home in your clothing, Jill Slater of Apartment Therapy both understands your struggle and offers a solution. After struggling with moths for months, Slater decided to begin freezing all of her clothing infested with the pests. She left items in the cold for 24 hours at a time, sealing everything in plastic bags during the process. Once out of the freezer, a quick wash cycle eliminated any leftover carcasses, and everything was refreshed. This trick also works on bed bugs, according to K9 Bed Bug Tracker. Like the freezer can refresh jeans, it can stop stinky T-shirts from growing worse without a wash. 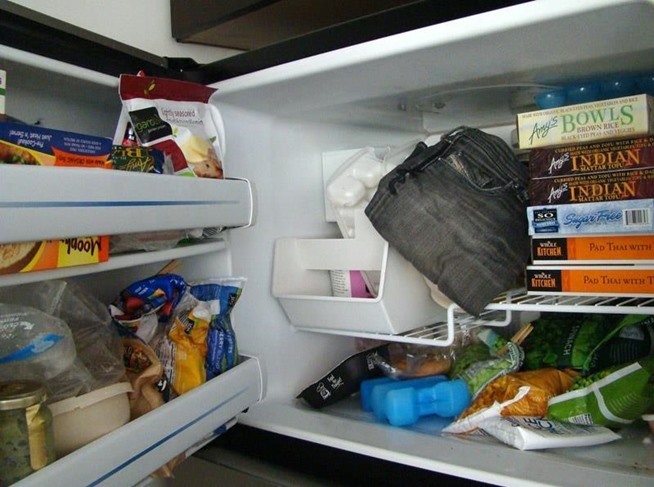 According to Huffington Post, the freezer is a color- and fabric-saving solution. 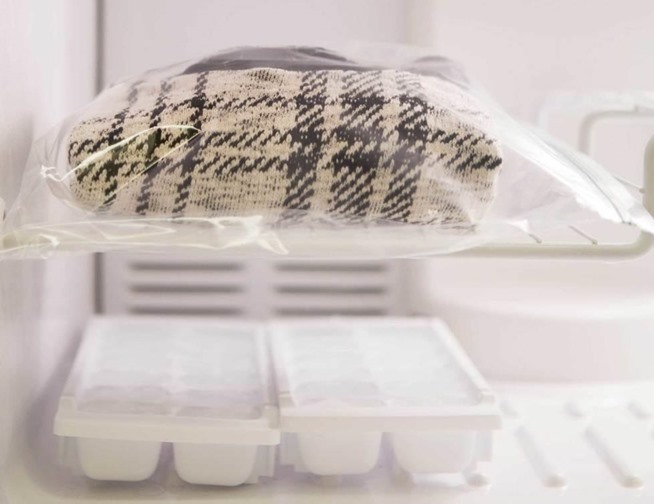 Whether you’re dealing with extremely sweaty and gross tees or gym clothes, the freezer can refresh the fabrics you depend on most in a pinch. Toss your most-worn clothing in the freezer, and you’ll be able to snag one more wear out of them before adding them to the growing pile of laundry. The same goes for workout wear, according to Bustle, as the freezer kills the bacteria that causes both smell and mildew in your sweatiest wear. Cleaning everything from your pillowcases and pillows to the bottom most layer of your bedding is a task usually reserved for big events like spring cleaning. Yet you don’t have to spend days and dollars to get your bed back into its cleanest state—just add your fabrics into the freezer. Shape recommends placing your bedding in the freezer rather than springing for a pricey deep cleaning service. Whether your pillows need to be freed from dust mites, or your duvet needs a refresh, putting them in the deep freezer can eliminate all that your washer and dryer aren’t able to. 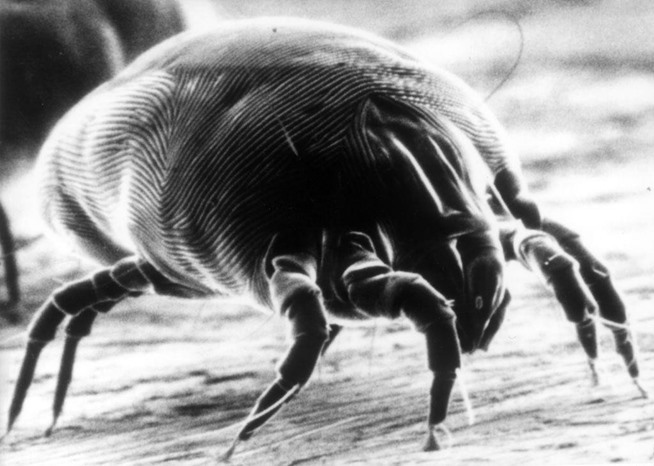 How to Clean your Mattress to keep Bedbugs and Dustmites away PERMANENTLY!